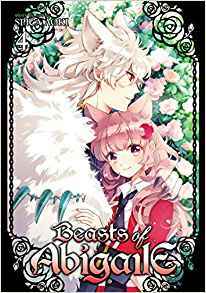 I hadn’t realized that Beasts of Abigaile was only 4 volumes long, and I’m guessing that the mangaka wasn’t planning on the series wrapping up so quickly either, based on the sheer amount of backstory and exposition crammed into one volume. Still, the story does end on a satisfying note, although I would have been fine to see the series get stretched out to 5 or 6 volumes in order to be able to spend more time with the supporting cast. Nina’s been captured and her secret of being a human at the werewolf academy on the island of Abigaile is threatened with exposure! She encounters a chained-up Giles, who fills in some of the details about the manipulation of Angelica the student body president who is nursing a special hatred for Nina. Nina is determined to be a force for good at the academy after hearing more about how its potential has been subverted by the school administrators. Roy is on his way to rescue Nina when she flies in with a high kick and they take off and hide in rose bushes to escape. One of the things that I like about this series is that for all of Roy’s alpha male blustering, Nina often manages to rescue herself through sheer determination. On the way to the resolution of the series, the reader learns about Nina’s secret past, Roy and Giles’ secret past, and Nina comes to realize exactly what her own feelings are. There are some spectacular revelations and many panels of people staring intensely through jail bars. 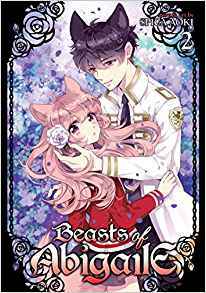 While this volume suffered a bit from too much story being crammed into a few short chapters, overall Beasts of Abigaile was a fun to read breezy paranormal shoujo series that I enjoyed. I hope it did well enough for Seven Seas that they continue to publish the occasional shoujo manga, as I like to see shoujo coming here from a variety of Japanese publishers. I enjoyed the first volume of this series more than I was expecting to, so I was hoping that the second volume would deliver more paranormal romance trashy fun, and I was not disappointed. Nina continues to attempt to survive her undercover existence at werewolf school, ending up with more power and influence than anyone would have predicted. Towards the end of the first volume, Nina takes an interest in Poe, a somewhat non-verbal artist who as an Omega, gets picked on by the rest of the students and the instructors. Nina is unhappy about the unsanctioned fight clubs that put students up against real live wolfs. Meanwhile, Roy and mean girl Eva seem to be having some significant fractures in their relationship, as Roy continues to find Nina fascinating, and Eva lurks in the bushes like a lupine Maleficent, spying on her possible female rival. Nina wants to let Poe into her pack, the White Rose Maiden Association, but the art kids that she hangs out with don’t want their status to drop by taking him in. They’d also be put in a position of danger in needing to defend him against other students as well. Eventually the situation boils over and Nina impetuously volunteers to take Poe’s place in the fight club. She declares herself Poe’s Alpha and says that she’ll fight all his battles for him. While Nina’s karate skills come in handy, she’s eventually rescued by Giles, who always seems to be around when she needs him. This volume filled in a little bit of the backstory, both with Nina’s past history with bullying that makes her a relentless advocate for the downtrodden, and also some of the history of the school and why Poe has been placed in such a lowly position. Roy continues to be a total jerk, and I’m hoping that Nina doesn’t end up with him in the end, but with the way shoujo manga tends to go I’m guessing Nina’s influence will change him from being a terrible person. The art in this series continues to be well-executed, even if it doesn’t have a very distinct style. I’m still enjoying this series, but I tend to be a bit of an easy mark for supernatural shoujo.